Despite the increasing popularity of GPS Devices and various electronics gadgets and gizmos - there is nothing as effective or as reliable for finding your way around the UK Hills and Mountains as a good map and compass. The Barigo Model 12 Analogue Compass comprises a fairly weighty metal casing with a flip up cover that protects the glass and also contains a mirror. It has a rotating bezel marked in degrees and a magnetic needle with North marked on the red end. Also included is a cord for hanging the compass round your neck or attaching it your clothing/map case and the whole package comes gift boxed. 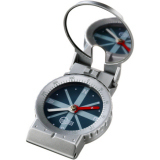 At first sight, this well presented, weighty metal compass feels like the real deal. It does (most of) the basic functions well - the needle points at north, the rotating bezel rotates with smooth precision, the mirror reflects and the lid includes a sighting 'hole' for taking bearings when you can see your target. The lid even flips up and down securely - though opening it for the first time posed this tester a bit of a conundrum. There is no useful Magnifying Glass (something I find I am needing more and more as I grow more er . . 'experienced') and the lack of marked scale means you cannot measure distance accurately on your map. It is also difficult to Set your Map accurately with this compass. To do this you would normally line up your compass up with the grid lines on your map and then rotate everything until your compass points at north. Unfortunately, the curved housing and lack of see-through rectangular base plate makes this difficult to do accurately. Furthermore, at 125g it is rather on the heavy side for a compass. A simple plastic compass that includes a marked Base Plate and Magnifying Glass is nearly a third of the weight - so you could take a spare one and still save on the weight. Classy feeling unit that simply fails to deliver. Serious walkers and hikers who rely on their navigation skills will find the cheaper plastic models with rectangular base plate, magnifying glass and measuring scale far more useful.